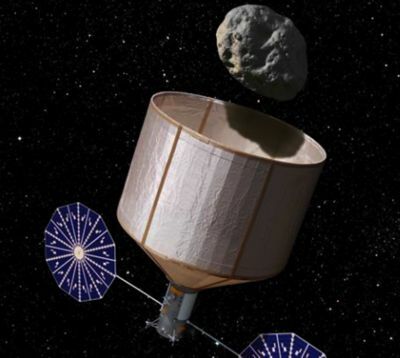 Senator Bill Nelson, chairman of the Senate Science and Space Subcommittee, has announced a NASA plan to capture as asteroid, maybe in 2019, and shuttle it into orbit round the moon. When the White House unveils its 2014 budget this week, it is expected that President Barack Obama will put aside $100m in planning money for the mission that might ultimately cost over £1bn. An unmanned robotic ship will intercept a selected small asteroid, match its trajectory, and capture it in what amounts to a large bag. A solar propulsion unit will send it on a course to intercept the Earth’s moon, whereupon a short burst will send it into a stable lunar orbit. At this point astronauts will make a short trip to visit it, examine it, and return samples of it to Earth. It all makes good sense, science fiction though it sounds. Scientists want to study asteroids close up to build up a picture of the early solar system and find clues about how planets and possibly life developed. Earlier proposals called for manned trips to the asteroid belt, with all the hazards of a long space voyage and the expense of keeping the crew alive and safe. The new proposal brings the material back to where it can be studied on a short-duration voyage that humans have done before. Although the asteroid chosen will be small, perhaps 550 tons, it is believed that larger asteroids probably formed by accretion of smaller ones, so it should give us valid evidence of their composition. As the back of some minds lies the notion that the information gained may enable us to save our planet from a future asteroid strike by diverting or destroying ones on a collision course with Earth.